Baby Costs > How Much Does a 3D Ultrasound Cost? A 3d/4d ultrasound is different from a 2d ultrasound in many ways. First, the 2d ultrasound “sees through” the baby layer by layer. This allows the technician to get a good look at the baby’s organs and determine if there are any health issues the baby may face. In this way, 2d ultrasounds are better. However, the picture received from a 2d ultrasound is usually unclear and the physical features of the baby are hard to spot. 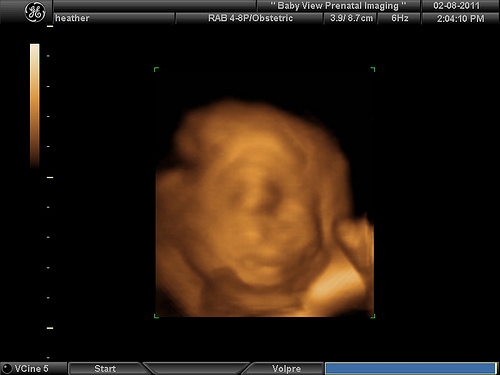 A 3d ultrasound takes images of the baby from three different angles, resulting in a 3-dimensional picture. This picture only shows the surface of the baby, which means the baby’s features can be seen much more clearly. The 4d part of this ultrasound is simply being able to watch the movement of the baby – this is usually recorded for the mother to take home. A 3d/4d ultrasound can cost anywhere from $100 to $300. This price range depends mostly on how many features you want. The more features you choose and the longer the session, the higher the cost will be. On average, plan on spending anywhere from $100 to $1,000. This will greatly depend on the ultrasound and the provider providing it. It will also depend if you have any sort of health insurance policy. Because a 3d/4d ultrasound is elective, insurance companies generally do not cover the cost. 3d/4d ultrasounds do NOT replace the traditional diagnostic 2d ultrasound. If there is a problem detected at the routine 2d ultrasound, an additional ultrasound may be recommended. In this case, insurance will usually cover it. eHealthInsurance.com is a great marketplace to find insurance companies that can help cover the costs. A certain number of 3d image prints from multiple angles will be yours to take home. A CD of all the pictures taken can be made so you can print the photos at home or local retailer. A DVD can be made of the movement (the 4d portion) for you to keep. Many places offer a teddy bear that has a recording of your baby’s heartbeat. Gender determination (or confirmation if you already know) can be included upon request. Theatre-style seating for up to 10 people to share the experience. The more prints included or the longer the 4d portion, the more expensive your experience will be. An ultrasound exposes the body to high-frequency sound waves that produce pictures inside of the body. Captured in real-time, you will be able to see the internal organs and blood flowing through the vessels. This test is very safe and is painless. Most sessions will last 30 to 60 minutes. 30 minutes will usually be the scan time, while the remaining time will include picking out the pictures you want. Some 3d/4d ultrasounds charge extra for things like DVD instead of VHS, glossy photo paper instead of thin paper, or color photos instead of black and white photos. Extra prints can cost $2 to $5 per 10 photos. The same can be said about extra DVD copies. Many are able to convert the baby’s heartbeat into a teddy bear. This can cost an additional $30 to $50. If you miss your appointment or cancel late, most facilities will have a late charge. This late charge can be as much as the entire appointment. If you have to cancel, be sure to do so within 24 hours. Be sure to get something to eat before heading in. The ultrasound process can be rather long. The doctor will recommend that you come in with a full bladder. This makes it easier for the ultrasound tech to get a better reading. Drink something such as water a few hours ahead of time to ensure that your bladder is full. Try to avoid drinking caffeinated items. People have stated that this can get the baby to move, but it will only make it hard for the tech to gather pictures during the process. If the hospital allows it, bring a video camera into the room so that you can capture the experience when you found about what gender you were having. While the ultrasound could be recorded onto a DVD, this won’t mean that the experience was recorded. Not all procedures will be covered by the insurance companies. Always make sure that you get pre-approval ahead of time just to play it safe. Before going in for an ultrasound, ask them who will be offering it. Will it be an obstetrician or an ultrasound tech? What kind of information are they able to give once the ultrasound is done? Most ultrasound companies recommend you come in during your 27th to 34th week for the best results. A 3D ultrasound is an advanced method that captures a true 3D image, often resulting in seeing special facial features. On the other hand, a 4D ultrasound is an actual moving image. With a 4D, you will be able to see the baby move and make movements such as yawning, turning or even sucking their thumb. A color doppler ultrasound will use a computer to computer measurements. It can also analyze the blood flow through the vessels. A power doppler ultrasound can provide greater detail in terms of blood flow inside of the organs. The downside to a power doppler is that the technician can’t tell the direction most of the time. A spectral doppler can display the blood flow in graphical measurements. It can also show the distance traveled per unit. Some facilities are cheaper during weekdays than they are at night or on the weekends. Many facilities offer military discounts. Facilities are going to be a lot cheaper than a hospital. If possible, avoid the hospital and have the ultrasound performed at a local private facility. Many 2d ultrasound facilities also do 3d/4d ultrasounds. If you schedule both of your ultrasounds there, a discount will usually be given. As long as the ultrasound is medically necessary, you should be covered. Check the official website to see if any specials are being held. If you don’t have any sort of insurance policy, ask them if you can receive a cash discount. Those who pay by cash or even by credit card in full can save up to 40 percent on their bill. Many local charity and organizations will provide ultrasounds at no cost if you meet certain income requirements. Most charities will ask that you’re at least 200 percent below the federal poverty level. If you do have to pay for the ultrasound out of pocket, keep in mind that you may be able to write these costs off at the end of the year. Be sure to save all the receipts and paperwork. A simple comparison of prices will not help determine the best deal. You must compare the cost as well as the features included to find the best overall value. Most facilities will allow you to come to tour their building prior to scheduling an appointment. Most facilities will provide sample pictures and videos for you to see. Remember, however, that there is no guarantee that your baby will cooperate! !